My kids loved digging for dinosaur 'fossils' hidden in plaster of Paris. (Click here to see how) We decided to try a cheaper and easier version - excavating for creatures hidden in ice. It was very easy to prepare and kept the kids entertained for ages. Time: 30 minutes plus freezing time in advance. 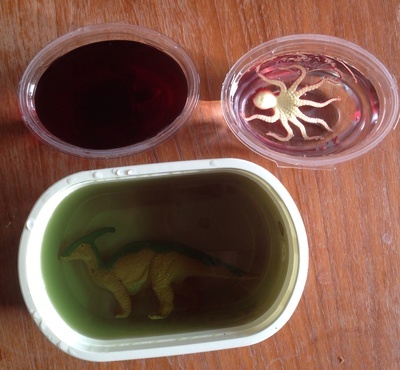 Add a plastic creature to each tub and cover with water. Add a few drops of food colouring and mix in if you want to make colourful ice. Put in to the freezer for at least 4 hours. Pop out and out the ice bricks onto a tray. 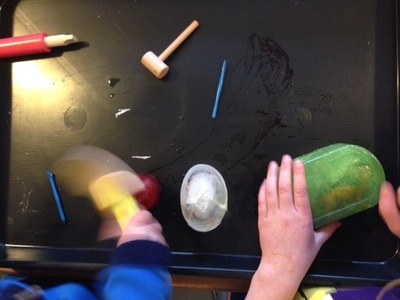 Set out toy hammers, toy chisels, spoons etc. 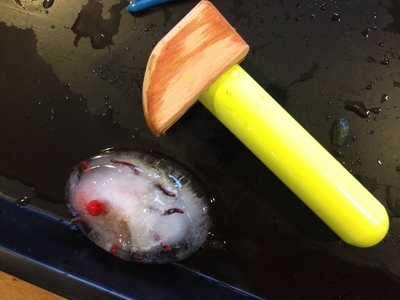 Allow the kids to hammer, or chip away at the ice blocks to excavate their creature hidden in the ice. A brush is also quite fun to brush off ice chips when the creature starts to be revealed.